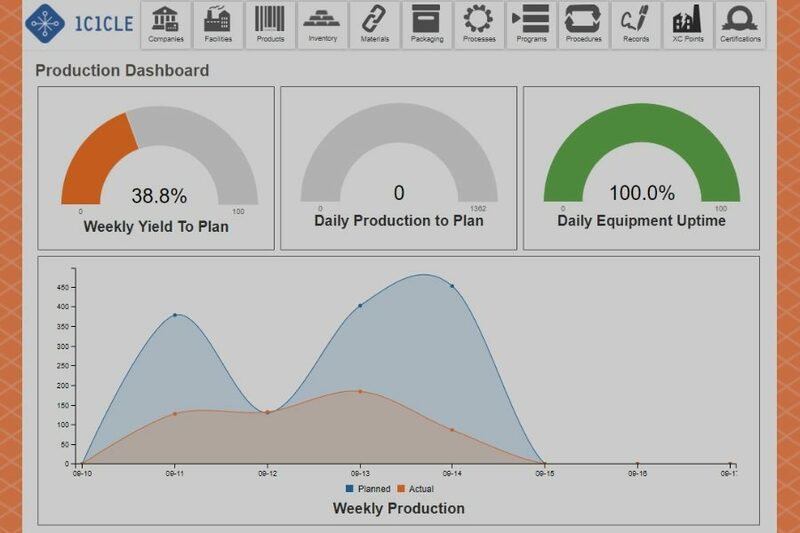 This installment of New Features looks at a whole slew of new ways for Icicle to make your life (and food production management) easier. Several new features to help you keep an eye on your ingredients’ and products’ shelf life to minimize waste and loss. New reporting features for production, sales, and purchasing also help optimize your processes – including our brand new Sales Dashboard. Other new features include: a new Change Log Interface, improvements to Quality Control Checks and Excel exports, additional oversight for inspections, approvals for purchase and sales orders, user-defined specification types, and price lists. This first batch of new features makes it easier than ever to maintain a view of the big picture so you can make the best possible decisions for your business. What does it do? One of the main ways we strive to makes our clients happy is by keeping everything in one place for you. Now there’s a dashboard that will give you a clear snapshot of sales in your facility too. 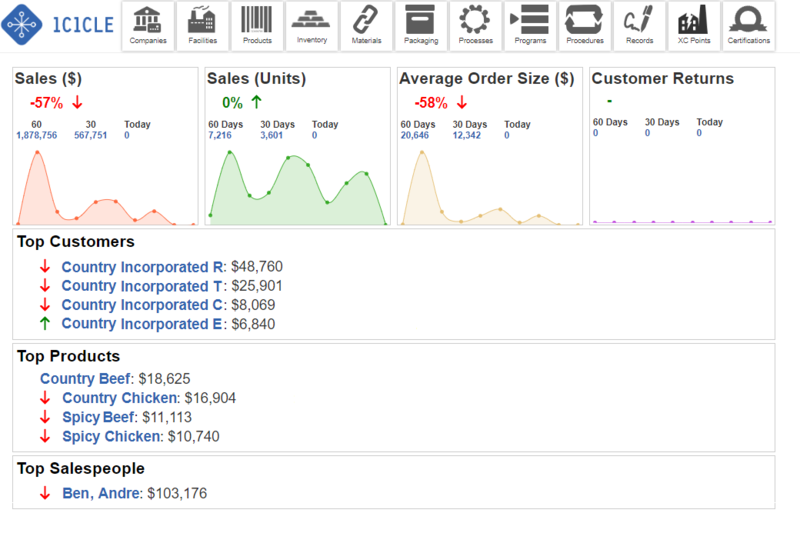 The dashboard has different metrics that are displayed at once and trend them over the last 60 days: your sales trend over time (in terms of dollars and units of product), your average order size, on-time delivery statistics, customer returns, top customers (and their trend for ordering), top products, and top salespeople. The new dashboard – the first in a series of four new Icicle dashboards! – gives executives at your facility a one-stop shop for a comprehensive picture of your sales progress over the last 60 days. Since it’s pulling data from your integrated Icicle database, your getting more than safety and quality – you’re gaining a new perspective on your sales health. What does it do? Want to see how your company’s production is going? You can now create a visual, tabular Production Report with various fields so you can see, at a glance, your actual versus planned production and how they fit together (for example, if you’re on track, if there’s a problem, or if you’re producing too much). Managers can view their production status at a glance for today, the entire month, or through other views and sort it according to your needs. 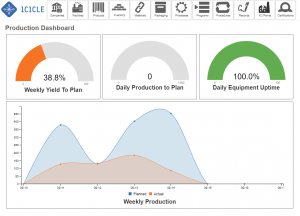 This links up with our other Production Forecasting and Production Status dashboards. Where did the idea come from? This one is an internal idea from our development team! What does it do? The new Sales Report feature gives you a searchable and sortable list of all your sales. If you want to see sales for a particular customer or date range, for example, you can bring up this report and it will immediately show you the sales for a product or product category, etc. This makes it easy to see how much product you’ve sold and helps with analytics and planning, with even more help from the Sales Dashboard. Where did the idea come from? Thanks to Paula from Fieldstone Organics! What does it do? While we were working on the sales report feature, we thought about other ways we could improve reporting features. You can now bring up a report with a listing of everything you’ve purchased (materials, packaging, ingredients, etc.) from a list of vendors for a specified time period in a sortable and searchable list. This helps you conduct an analysis of your purchasing history for assistance in planning and optimizing your inventory efficiency. Where did the idea come from? Another internal idea from our development team. What does it do? Much like the Sales Report and Purchasing Report, the Production Report shows you all the products you’ve produced and can be filtered to one specific product over a specified time period. If you want to see how much of a particular item you’ve produced, you can do that easily. This way, you can optimize and plan for production efficiency. Where did the idea come from? This one is also from our development team. These next features all look at helping you keep track of what is nearing the end of its shelf life so you can reduce waste, maximize efficiency, and maintain great customer relationships. What does it do? We have a series of improvements to Icicle related to shelf life that helps you reduce waste and maximize efficiency. The big picture item is the Remaining Shelf Life Interface, which is a single interface where you can see your entire inventory and the remaining shelf life of all your products and ingredients. You can specify the shelf life for your products and ingredients in Icicle. This interface and the reports it can generate allow you to easily determine which ingredients are about to expire or which have already expired so you don’t get stuck with inventory that ends up in the garbage. Where did the idea come from? A big thanks to Steve from Sobey’s for this idea! What does it do? You now have a new interface to keep track of shelf life, but the benefit doesn’t end there. Icicle also flags ingredients with insufficient shelf life during production runs themselves. For each ingredient, you can set the minimum remaining shelf life and, when it comes time to add that ingredient in a production run, you can see the remaining days of shelf life left on that lot of that ingredient. If it’s insufficient, it’s flagged in red. This feature will extend the shelf life of your products by avoiding premature spoilage and make it easier for employees to notice errors. Where did the idea come from? This idea is one of many this month that comes from Nadia from Aliya’s Foods! What does it do? The last new feature related to shelf life comes in at the other end of production: for finished products. When you’re shipping products out to customers, you need to ensure that you have sufficient shelf life on those products. With this new feature, the Shipping and Picking interfaces will display, in red, if a product’s shelf life is insufficient according to the minimum shelf life that you can set directly in the product edit page. This new feature helps you maintain good relationships with your customers and prevent errors. Where did the idea come from? This isn’t even the last good idea from Nadia in this issue of New Features. The last batch of new features focuses on making audits and inspections easier by making your information more accessible, providing you with more options, and preventing errors by providing extra layers of oversight and control. All of these things help you get organized faster, minimize human error, and keep auditors happy – not just with food safety but also for quality! What does it do? Icicle has always included an audit trail feature that records who did what for elements that touch your food safety program, including adding a record of the reason for any change. Some Icicle users reached out to us because they wanted more detailed records for GFSI-compliance, such as the ability to authorize a revision, review a revision, indicate whether or not additional training was required or if there was an adverse safety impact, etc. This has now been implemented within a number of places within the system. Whenever you edit an assessment, supplier, or formula, etc. there is a new Change Log Interface, which is searchable and sortable. You can use these records to quickly and easily show the auditor these records in detail. The previously existing audit trail function is unaffected and still available within Icicle. Where did the idea come from? Thanks again to Nadia from Aliya’s Foods! What does it do? The QC check now provides a warning to the operator entering the data if the value they are about to enter is outside of the acceptable range. In other words, if the QC check has failed, users receive a visual warning before the check is committed (i.e. saved). Previously, users could potentially make mistakes without realizing that the value was out of range. This improvement provides an extra layer of oversight and control for quality control. Where did the idea come from? Another great idea from Nadia from Aliya’s Foods! What does it do? Related to the improvements to QC checks (above), we also added an additional layer of data to Excel reports. Now, when you export a QC check from Icicle to Excel, you can see an expanded number of fields including verification information, tester information, timestamps, and so on. The exported document has also been reformatted to look nicer! Where did the idea come from? Yet again, this one comes from Nadia from Aliya’s Foods! What does it do? Previously, you could add an inspector and finalize a record for an inspection. In order to make audits pass even more smoothly, you can now also record who is monitoring an inspection activity and verify the inspection before finalizing it. These two extra layers of oversight give auditors more confidence that you are working above board. Where did the idea come from? Aliya’s Foods is full of good ideas! Check them out here. What does it do? The new Approvals option for purchase and sales orders is an opt-in feature, meaning that it will not affect your company unless you enable it in your (primary) company’s detail page. If you go to that page, you now have the option to turn on approvals for purchase and sales orders. This means that when you create a purchase order, the receiver will not be able to easily see the purchase order unless it is already approved. Once it is approved, the purchase order is clearly visible for the receiver. Approvals for sales orders work the same way. If the sales order isn’t approved, the shipper won’t see anything outstanding for the customer in the picking interface. Enabling approvals helps keep the receiver from receiving items that haven’t been approved for purchase and the shipper from shipping items that haven’t yet been approved for sale. Where did the idea come from? Nadia deserves the credit for this one too. What does it do? Previously, when you went to the product detail interface, you could define two separate regions for quality specifications (i.e. specifications intrinsic to the product itself) and process specifications (i.e. related to things around the production run but not intrinsic to the product itself). For example, say you’re making chocolate; creaminess is a quality specification whereas the temperature of the melter is a process specification. Our users asked us for more flexibility for user-defined specifications, such as GFSI-specific QC checks. Not only are product and process specifications consolidated into a single region on the product details page, we’ve also added a type field that gives users the ability to add as many user-defined types as they would like through the Administration section. Where did the idea come from? Thank you yet again to Nadia from Aliya’s Foods! What does it do? This cool little feature lets you create supplier price lists and product price lists that are integrated with purchase orders and sales orders. Of course, product price lists are the prices you charge for your product, while the supplier price list is for the prices of the items you buy from your suppliers. You can already create purchase orders and sales orders in Icicle, but Icicle didn’t automatically fill out pricing for you – you would have to add them manually. Now you can pre-populate the price list with the prices, so that when you create a purchase order for a supplier and you add items to the purchase order that you want to buy, Icicle will automatically look for a price list for those products from that supplier and automatically add the values to the purchase order. It works the same for sales orders. Say a customer calls you and orders product. When you create a sales order for that sale, Icicle will automatically add the prices. Prices on both sides can be adjusted for each item in the purchase or sales order. Discounts can be applied easily. Where did the idea come from? This most excellent idea is from long-time Icicle power user Paul from P&S Frozen Foods! Keep up-to-date with the latest Icicle features by signing up for our newsletter! If you have a feature request or question, submit a request and our team will get back to you.